GREER, SC -- Declaring "we are the ones that brought up" the topic of Medicare, Mitt Romney tried to pivot to offense on the topic of the popular entitlement program, telling reporters today that Americans have a "stark choice" between his vision and President Obama's. Writing on a white board used as a prop, Romney sought to clarify the difference between the two campaigns' positions on Medicare. Obama's means bankruptcy, Romney said, casting his own path as one toward solvency. Presumptive GOP candidate Mitt Romney breaks out the white board in Greenville, S.C., to compare his proposed plan for Medicare with that of President Obama's. "My plan presents no change. My plan stays the same. No adjustments, no changes, no savings. The president’s plan cuts Medicare -- excuse me, well let’s see, I’ve got, there we go, by $716 billion cut," Romney said, scribbling on the board. "In addition, the trustees of Medicare estimate that approximately 4 million people will lose their coverage under Medicare Advantage. This is the plan they’ve chosen, the chose they prefer some 4 million current seniors will lose their Medicare Advantage plan." Romney disputed that his plan for future seniors could be called a voucher system, and argued that it would create more choice and less government interference for younger workers who have not yet approached retirement. He said his plan would keep Medicare solvent by lowering costs through greater competition, and by indexing benefits to income levels, meaning higher income seniors would receive fewer benefits than those with greater need. "The plan that I've put forward is a plan very similar to Medicare Advantage," Romney said. "It gives all of the next generation retirees the option of having either standard Medicare, a fee-for-service-type, government-run Medicare, or a private Medicare plan. They get their choice." 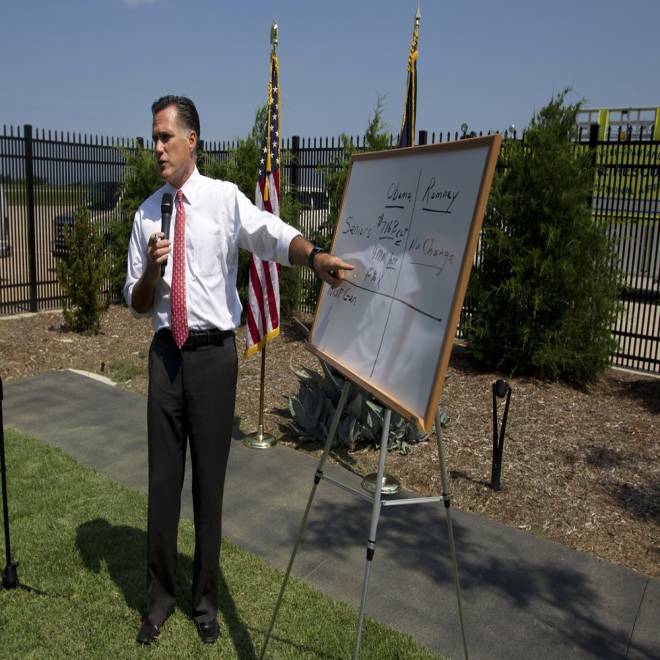 Republican presidential candidate Mitt Romney points to a white board as he talks about Medicare during a news conference at Spartanburg International Airport Aug. 16. Since the selection of Rep. Paul Ryan as Romney's running mate on Saturday, some Republicans have fretted that the younger congressman's own Medicare plan, which includes the same $716 billion in Medicare cuts that Romney decries, might be a distraction from Romney's core message on the economy. Romney disputed that too, calling Medicare a "big issue," that could sway seniors to the GOP ticket this fall. “I think we are the ones that brought up the topic. I wanted to make sure that people understand what the president has done in welfare, what the president has done in Medicare," Romney said. "In both places he’s made pretty dramatic changes which I think the people of America will find illustrative of a very different point of view than I think most people have." Romney also stuck by the fiery rhetoric he deployed on Tuesday night, when he called the Obama presidency "angry and desperate" to hold onto power. "I think the American people are also disturbed with a campaign that's been as divisive as this campaign has been," accusing the Obama campaign and the vice president of tactics "unbecoming of the presidency." Asked whether his own language, including telling supporters at rallies and fundraisers that the president does not understand America, contributed to the negative tone of the campaign, Romney did not respond, calling on another reporter to ask the next question.